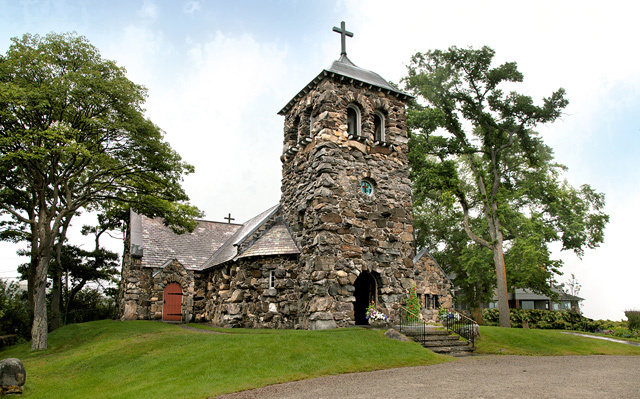 Our picturesque Stone Chapel has been in continuous use as a summer chapel since it was consecrated on August 24, 1892. It is one of 18 historic summer chapels in the Diocese of Maine. The first parishioners of St. Ann’s gathered in 1883 and worshiped in a pine grove near the present site of the Kennebunkport Inn. The Rev. George J. Prescott of Boston led the services and he was assisted by The Rev. John A. Bevington of Wareham, MA. In 1885 Mrs. Frank G. Ilsley of New Jersey proposed that a church be constructed. A conceptual drawing was created by Henry Paston Clark (1853-1927), a noted Boston architect who designed many of the shingle homes in the Kennebunkport area. Funds were raised and the current site was donated by the Kennebunkport Seashore Company. The cornerstone was laid on August 22, 1887. Five years later construction was completed, and the church was debt-free. The church was consecrated by The Rt. Rev. Henry Adams Neely, DD, Bishop of Maine, on August 24, 1892. Since that date, the church has been used as a summer chapel without interruption. In addition to volunteering his services to create the conceptual drawing, Henry Paston Clark, also donated his services as architect for the church’s construction. When the Kennebunkport Seashore Company donated the site, it included the rights to gather and use the stones at hand. Hence, the construction of a stone – instead of a wooden – chapel. The large sea-washed stones were hoisted and dragged to the church site during the winter of 1886-1887, and work on the building began May 27, 1887. The south transept and baptistery were added in 1920; their construction were made possible through a gift from Nathaniel Wilson of Washington, DC in memory of his wife, Annie Edwards Wilson. The north transept was built in 1925 and made possible through the gifts of Erickson Perkins and others. This addition increased the chapel’s seating capacity to 220. More than 100 years passed before major restoration work was required. In 2004 a capital campaign was launched to fund the necessary work. Many people who worshiped at St. Ann’s and valued its beauty were generous with their donations. Because of their financial support, the subsurface footing and walls of the church were stabilized in the winter of 2005-2006. As the work progressed, it was discovered that the bell systems and carriage in the chapel tower also needed attention. They were lifted out and restored, as well. Other restoration work included replacing the stained glass window frames, and restoring the windows, chancel, transepts and sacristy. The church requires regular maintenance, and parishioners and visitors are encouraged to donate to St. Ann’s Preservation Endowment Fund to sustain St. Ann’s for future generations. The same sea-washed stones that grace the building’s exterior were also used for the interior of the church and sacristy. The altar, which was rebuilt in 1900 as a memorial to Bishop Neely, consists of polished Siena marble with a two-inch slate mensa with five crosses cut thereon. The roof over the central part of the church (the nave) is framed with hard pine hammer beam trusses and the floor is cleft slate. The altar area (the chancel) is lined with buff Scotch fire-brick and has a white marble mosaic floor. The wall around the altar and the altar steps are polished Italian marble. Due to severe Maine winters, the altar began to disintegrate and was replaced in 1959 with an exact replica made of polished light pink granite cut from Maine quarries. The pews and clergy stalls are made of oak and were designed especially for St. Ann’s Church. The Annunciation diptych, painted by St. Ann’s architect Henry Paston Clark, was inspired by the work of Italian Renaissance artist Fra Filippo Lippi (c. 1406-69). Donated in memory of Clark’s father, the pair of paintings hang behind the altar. The Bishop’s Chair, located to the left of the altar, is Italian beech and walnut, and reputed to be over 400 years old. It was presented to St. Ann’s by Margaret Woodbury Strong. An earlier Episcopal Chair, on the right side of the chancel, was the gift of J.H. Brazier & Frederich W. Moss. The needlepoint kneelers at the chancel altar rail and on the personal prayer kneelers were designed by Patience McCormick-Goodhart Agnew in 1976. They depict the history and symbols of St. Ann’s, as well as scenes from the Kennebunkport community. They were hand stitched by the ladies of the church. The limestone baptismal font, originally placed at the tower entrance and now in the baptistery, was given by the children of the church in 1902. The colorful bas-relief copy of Michelangelo’s Holy Family and the majolica urn – both in the entry area of the church (the vestibule) – were purchased in Florence, Italy and donated to St. Ann’s by architect Henry Paston Clark. There are twenty-five stained glass windows in the church proper and an additional six in the sacristy (the room where vestments and sacred vessels are stored). Many of them date from the late 1800s/early 1900s. Of particular note is the trio of windows on the north transept wall, given in memory of Samuel Howell Jones, Jr. and Rees Lockwood Jones. The anchor, crown and lilies, and cross subjects feature shells and glass “jewels” in the design. They were once reputed to have been produced in the studios of Louis Comfort Tiffany, but are now thought to be the work of Walter Cole Bingham who also worked in New York City and was known to incorporate shells in his windows. In 1994 St. Ann’s replaced the original organ with a digital Allen organ. This replacement was made possible through a number of memorial gifts which were prompted by a generous lead gift in thanksgiving for the life of Dorothy Walker Bush by her family. The Allen Organ Company is the largest builder of organs in the world that use digital technology. The Allen organ provides the grandeur of a pipe organ’s sound but is not adversely affected by the extreme climate conditions it is exposed to in Maine. The organ never needs tuning and has never had a service call since it was installed. An added bonus is that it cost $55,000 instead of the more than $300,000 that a pipe organ would have cost (in 1994). The gardens on St. Ann’s property are maintained with contributions from members and friends of the parish. One of the largest gardens is the Memorial Rose Garden, which you see on your left just as you pass through the main entrance gates. It was donated and is maintained in memory of Roy and Madeline Peers by their family.